Where I come from in North Carolina, this is the time of year when your yard starts to look like the jungle in Jurassic Park. By the time you finish mowing the lawn, the grass is already back up past your ankles, and every plant in the garden is supersized thanks to the blazing days and almost daily afternoon thunderstorms. I am not exactly short, but it's safe to say there are tomato plants in my mom's veggie patch right now that are taller than me. In the humid heat of July, everyone and their mother starts to wonder if they planted too many "tamaters." The kitchen counter is covered with them and you have to think fast or toss all that precious goodness into the compost pile. Canned homemade spaghetti sauce is always a go-to option, but this salad is a great way to enjoy them while they are still fresh. 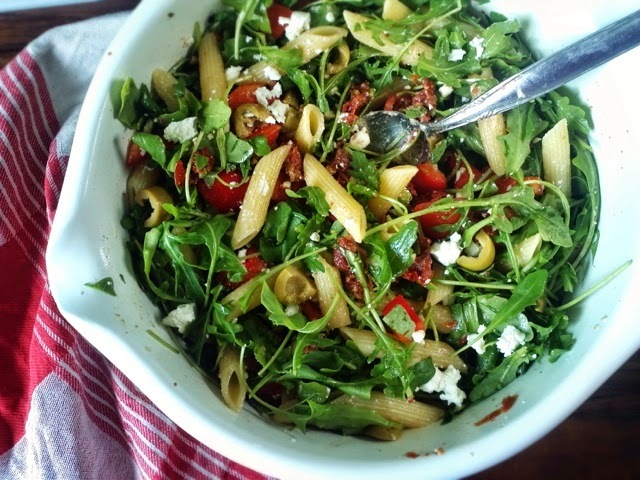 Juicy cherry tomatoes, salty feta, spicy baby arugula and savory sun-dried tomatoes with a few handfuls of pasta. This summer salad is quickly becoming a favorite at our house, because its fresh, filling and fast! Unlike most pasta salads that are heavy on the pasta, mayo and Miracle Whip, this one is packed with veggies that won't leave you feeling bloated or sluggish. It's a great option for those who want to go easy on the carbs without cutting them out all together. I like to think of it as happy middle ground that can please the pasta-lovers and the carb- or gluten-conscious alike. To make this a gluten-free meal, just use a gluten-free penne. The Food Babe has a list of the healthiest gluten-free pasta options here. If you are feeling adventurous, replace the pasta with two spiralized zucchini. It makes for a totally different texture, but is still delicious! If arugula seems a bit too spicy for you, just reach for baby spinach instead. Make sure to wait until you are ready to eat before dressing the salad with lemon juice, since spinach does not seem to hold up as well against the acid. Arugula: Eating this leafy green is great way to strengthen your bones. One cup contains almost half your daily recommend value of vitamin K and it has just as much calcium as spinach. You can also absorb this calcium better than in spinach thanks to lower levels of oxalates, a substance which inhibits calcium absorption. Few people realize that arugula is also a cruciferous vegetable right alongside broccoli, cauliflower, kale and your other nutritional powerhouses. Just like all of them, arugula contains glucosinolates that mix with the enzyme myrosinase to produce isothiocyanates. This compound neutralize carcinogens in the body and has anticancer properties. Oh yeah, 1 cup = 5 calories. Unreal. Tomatoes: Vine-ripened tomatoes are a great source of vitamin C, vitamin A and B complex vitamins (boosts immune system, cell repair and metabolism). They contain the carotenoid lutein, which supports healthy vision and may help against macular generation. They contain three antioxidants, zero-carotene, phytoene and phytofluene, that help fight disease and prevent cell aging. The phenolic acid in tomatoes also helps fight lung cancer. When cooked (like in speghetti sauce :), tomoatoes are a rich soure of cancer-fighting lycopene. 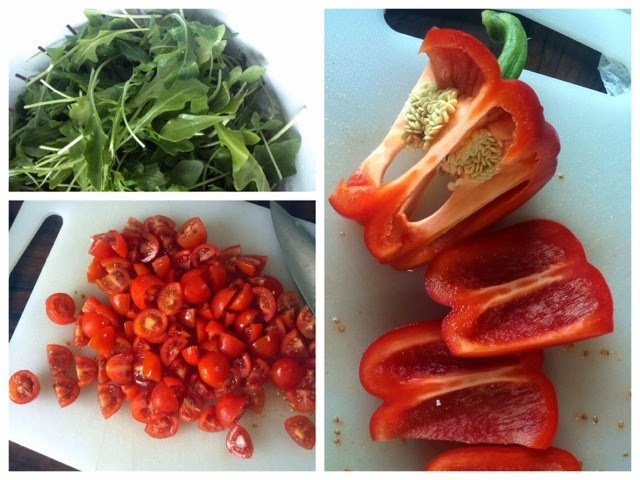 Red pepper: In terms of nutritional value, red peppers have a lot in common with tomatoes. They are also low in calories, a good source of vitamin A and C, and contain the cancer-fighting compound lycopene. They also contain the carotenoid beta-cryptoxanthin, which is believed to lower risk of developing lung cancer. Try to buy organic bell peppers when you can though, because this vegetable is considered one of the most pesticide-contaminated foods. 1. Prepare pasta according to package, run under cold water and drain. 2. While pasta is cooking, prepare vegetables. 3. 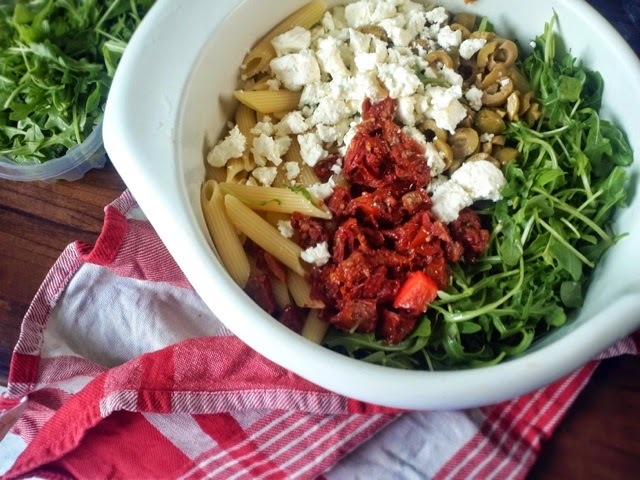 In a large bowl, add pasta, vegetables, feta, lemon juice and toss to combine.